Humanity may be incredibly advanced, but we’re generally still unnerved by darkness. Of course, if you’re in the market for night vision goggles, you’ve clearly decided you’d like to side-step any uncertainty brought on by the dark. In your case, you’ll probably be more unnerved by a set of goggles that keep sliding off your head, or a battery that just doesn’t last, or optics that aren’t worth the price tag. 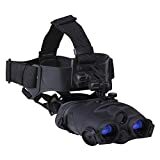 Luckily, you don’t need to go out into the darkness of Amazon’s unlimited options to find a night-vision system that reliably provides vision at night. This quick list should give you some great options to consider, and some important details to look for if you prefer to shop for yourself. The Firefield 1×24 system is the technology of yesterday’s future, with a price point to match. Ranging from $460 – $600, it is one of the best possible options you could find in the entry-level market. To be clear, top-of-the-line Gen 3 systems are currently in the $20k range, with the features to match. Firefield has instead chosen to focus on simple, reliable functionality, and it has paid off. Consumers interested in night vision are usually hunters, hikers, and anyone prone to outdoor activity at night. There’s almost certainly a gang of goggled paintballers out there most nights, too. Point being, this set delivers two features that quickly become invaluable when you’re in the field: Hands-free and Binocular. The secret, black ops agents in movies may look really cool with that crazy, cyclops night vision headgear, but humans have two eyes for a reason. Depth perception, particularly when navigating at night in unknown terrain, is an advantage you shouldn’t have to give up just to supernaturally see in the dark. With Firefield’s Tracker, you won’t have to. Each tube is also adjustable, so if you wear glasses, you can simply dial in each diopter for whatever your eye requires (an eye exam chart and a doctor asking, “how about now?” are obviously, sold separately.) The lenses are capped with soft eye cups that should mold to most any face you throw at them. They are water-resistant, and the lenses themselves have anti-fog and anti-moisture coating to keep you from going blind. Lens caps are of the flip-down variety, which as we all know, makes a great difference in the likelihood of you continuing to possess lens caps for the life of the goggles. The head mount is comfortable, secure, and adjustable. Although, its stability comes at the cost of being easily-adjustable out in the dark. You should be able to easily manage the light adjustments needed to secure it, but if your child is keen to try it out, you may need a good flashlight to get it to fit properly. Of course, the included neck strap means you can pass these goggles around as a pair of binoculars that happen to see in the dark….and which only have 1x magnification. Truly, this isn’t a problem for night vision, but it’s important to understand the difference from actual binoculars. This set also requires about three feet to focus properly, so unfortunately you won’t be reading any books via night vision. As far as visible range, it’s going to depend on the ambient light available. A clear, starry night might give you a solid 300 feet of illumination, while a cloudy night could cut that down to 150-200 feet. 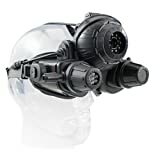 The included IR light on these goggles projects extra illumination approximately 180 feet, making sure that even on the cloudiest night, you’ll be able to power through the darkness. Depending on your usage, this might not necessarily be preferable. These IR lights provide a fantastic boost, but carry the same issues as visible bright lights do during the daytime. Any light added will make distant, darker objects that much more difficult to make out. The optics of this set really show off the commitment to craftsmanship that Firefield puts into its products. You may not get magnification, but details are clean and crisp at 3 feet or 300. Along with the adjustments available for each eye, there is a master focus knob in the middle that’s responsive, and easy to locate without removing the headset. The build quality is solid, and it feels incredibly natural to flip the goggles down for use, and back up when they’re unneeded. The Firefield Tracker *does* require a pair of CR123A batteries to operate, and they are *not* included. However, they are not hard to find, and should only run you about $20 for a 10-pack and charger. They have a long shelf life, are small and easy to pack, and you should get plenty of use out of each charge. Altogether, this is pretty much the ideal package for the price range here. You won’t be getting all the features you could dream of, but you’ll be getting more than you could have hoped for five years ago. And compared to a more-expensive, single-eye handheld scope, the utility available in this set is genuinely impressive. Trading quality for cost, the EyeClops makes no apologies for its intended market. 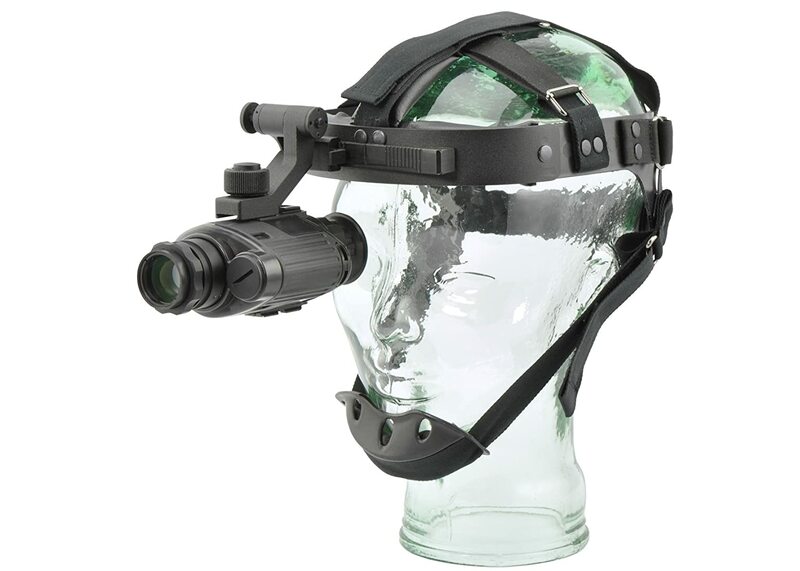 For around $80, you get a genuine night-vision experience. That night-vision experience is also hands-free. The rest of the specs may not exactly impress, but they still should if you keep the price in mind. 50 feet of viewing range, helped along by a ring of red LEDs around the eyepiece. These can be switched on and off, to either maintain your child’s stealth capabilities, or to maintain your own sight of them. The goggles fit securely to the headset, but there is only a monitor for one eye. An eyepiece over the “off” eye that can be flipped up to allow normal vision. There can be a bit of disorientation due to the center-positioned camera sensor, as well as the expected loss of peripheral vision and depth perception. Thankfully, the headset itself is comfortable, with soft rubber adjustable straps for a snug fit. This is a starter set of night vision goggles that will work best in familiar environments. They’re not recommended for hiking out into the unknown, and carry a notice about parental supervision. But for playing in your own backyard, or within hearing range of a group of night-blind adults, it’s hard to beat the hands-free, genuine experience on offer here. And to be clear, this is why EyeClops makes no apologies for its compromises. Even the name proudly revels in the fact that you won’t get a binocular experience, and that’s fine. The headset itself is certainly designed for sci-fi stylings over a more conservative, functional form. The fact that it takes 5 AA batteries, inserted in a pack on the back strap, can be seen as another disadvantage….or an effort to maintain accessibility. Chances are, you won’t have to go to a specialty store or shopping website to power this thing up when you get it, you’ll just have a rummage in the junk drawer. Optics are good, not great, and with none of the anti-fogging coatings you might have hoped for. The gain is respectable for the cost, and though the red LEDs may ruin stealth opportunities, they do nothing to ruin opportunities of “looking like a crazy cyborg in the middle of the woods.” It should be noted that our #1 pick, and its invisible IR light, are *not* capable of making you look like a cool robot. Really, by aiming at kids, the Eyeclops actually includes some surprising features just to increase the interactivity available. For example, there’s an option to change the screen from the classic green night-vision, to the black-and-white version. There’s no real functional change in what you’re able to see in the dark, but the option itself means another chance for your child to investigate and experiment. And of course, the change in contrast *can* be useful. But really, any opportunity to augment the experience can provide value to a young explorer. It might not be a feature you should look for in a night vision system for yourself, but you should be happy to know that its real value will almost certainly be found in your child’s fond memories….of that feature that didn’t technically make much sense. This is truly the definition of this design, and why it’s listed in second place. Features of professional night-vision systems were absolutely lost as the cost of the product was driven down to something manageable, but they were replaced with a kid-centric philosophy that should deliver a high-tech toy that exceeds even its affordable value. Yukon’s 1×24 goggles brings us back to the $400-600 price range, with all the comforts that come with it. Though, it should be noted, while severely lacking any robo-cyborg design flourishes. 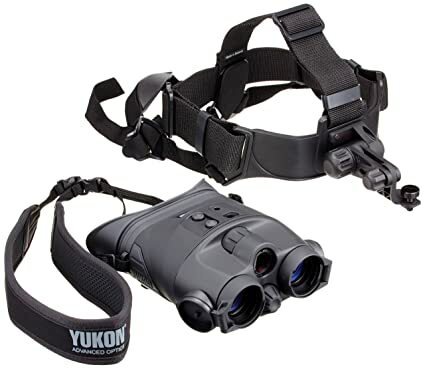 The Yukon NV presents a compact, sturdy set of goggles, with a feature set comparable to the Firefield Tracker. You’ll get high-resolution optics with the expected anti-fog coatings. The casing is water and dirt resistant, with a comfortable soft-touch rubber coating to maintain grip in any scenario. The goggles are presented with the standard hands-free, flip-up headset. Without deviating wildly from other options, it seems to have excellent padding and construction. You’ll have easy adjustment of the goggles and the usual options for altering its fit. Although, the headgear itself remains a bit of a puzzle if you’re fumbling in the dark. It should be noted that these goggles, like Firefield’s, include “Eclipse Lens Cover System.” This means that the covers have small pin-holes in them, so that when they’re flipped down over the lenses, you’re able to use the goggles in daylight. While limiting the amount of light reaching the sensor certainly does enable daytime use….you might guess at the limited applications for this feature. Still, each company integrating the *Eclipse Lens Cover System* is confident it’s a feature worth excitedly noting for consumers. Maybe you’ll be the one to figure out why. Also like the Tracker, Yukon’s NV has dual-diopter adjustment with a central focus ring bringing it altogether. Those with glasses can once again play eye doctor until they can see properly, and no one will have to worry about trying to cram a pair of lenses into the soft eye cup. Optics are excellent, with a relaxed viewing range that makes reading a book a viable prospect. Still only 1x magnification, yet these goggles really do a lot of work to match what you’re able to see with what you’d expect to. Some systems have an offset to their visuals that can be difficult to overcome, but Yukon seemed intent on maintaining a comfortable flow of visual information keyed into the preferences of the user. When it comes down to it, Yukon’s offering is simply another solid entry in this particular range of devices. The included IR illuminator brings viewing range up on overcast nights, with the expected blow-out from adding a big LED light to a nighttime setting. Still, when it comes to a device that costs $450 on a good day, having something sturdy and reliable trumps any feature you could really ask for. These goggles provide nighttime visibility in a hands-free form factor, or with a neck strap for more casual use. Their rubberized exterior makes them easy to hold on to, with very little chance of moisture compromising the electronics, or your viewing experience. These are the features you can expect at this price, and Yukon delivers them here. They may not surprise you with their feature-set, but chances are, you’ll be pleasantly surprised by a long lifespan of delivering high-quality first generation night vision. Oh, and batteries? 2xAA. For anyone making regular camping trips, that could be far better news than a fancy rechargable lithium-ion power pack. These specs can share juice with a television remote. Remember how great binocular night vision is? Well, if you want to chop the price in half, just chop the device in half. The Armasight Vega carries pretty much every feature of the #1 and #3 choices, for only one eye. The included headset is surprisingly comfortable and stable, and allows you to choose which eye you want to have superpowers and which eye you’ll use if someone turns on the lights. Adjustments are simple, and the smaller device only increases the comfort of strapping it to your head. You’ll also find an included CR123a rechargable battery, with a solid usage time and plenty of opportunity to carry spares. Of course, you’re still getting a deal here, and some of the functionality will be lost in the process. For instance, this device arrives with a fairly low-power, short-range IR illuminator. Armasight absolutely carries more high-power options, which are compatible with this system, but you’ll be paying extra for the privilege. Considering the limited range of sight at play when you are using illumination of any kind, this isn’t necessarily a deal breaker. A softer, shorter beam may actually give you more comfortable, practical use for seeing your immediate surroundings than a high-powered beam bouncing off everything in sight. Of course, it will ultimately be up to you to determine what fits your needs best. The rest of the features are what you’d expect. Soft, rubberized, water-resistant exterior and a sturdy frame make this small night-vision solution appealing in its own right. You may miss the depth perception and wider field of view offered by more expensive goggles, but if your use includes any chance of running into exterior lighting, you’ll be happy to have an eye free to handle it. In the old days, pirates used eyepatches to deal with quick transitions from light to dark, and you’ll find comparable benefits in the flexibility offered here. It’s not an all-in-one solution to maintaining visual awareness, just a fantastic tool for expanding what nature gave you. And that’s the value of Armasight’s offering here anyway. You get a professional, first generation night-vision solution, with just enough room to expand its capability to match your needs as you discover them. Technically, you could even get a second device to add a binocular option…though the result would likely be more cumbersome and expensive than simply springing for a binocular set in the first place. Point is, if you’re just wading in to night-vision, this is a great, reliable device that should work great until you’ve got an incentive to upgrade. One of the most important decisions you’ll have to make regarding a night-vision solution is also the least-exciting. These devices maintain a general, 3-tier system of consumer/prosumer products. As time has gone on, this has grown to include some specific marks of each device level. For example, if you want thermal imaging, you’ll have to jump to at least tier 2 in the goggle/monocle arena. That is, generally over a thousand dollars. Yet, thanks to the endless march of technology, you can purchase an add-on for your cell-phone that will deliver thermal imaging for $300. Still, you’ll have to use common sense. That sensor, for instance, obviously doesn’t carry much in the way of optics, and relies completely on your cell phone for visualizations. Still, this is an easy consideration to get out of the way first. Look at your needs, and see which tier addresses all of them, including financial. If your profession could benefit from thermal imaginging, but you don’t *need* a professional lens system, then the add-on could be your best value. Similarly, 3rd-tier technology from ten years ago might fit your needs perfectly in its current 1st-tier incarnation. Figure it out! Binocular, Monocle, Head-mount, neck strap, compatibility with other devices…these are the sorts of considerations that will determine what device serves them best. It’s in the best interest of any company producing a device that costs several hundred dollars to make sure their customers are satisfied with the purchase, so thankfully, this is an easy determination to make. Most anything over $300 is going to include a head-mount and neck strap already, so like the cost, it comes down to your intended use. If it’s casual nature observation, a small monocular around your neck could be preferable to a hefty pair of binoculars on your head. If you have a job where you’re driving at night, stopping to survey, it won’t make much sense to jump right to a head-mounted system that costs more than the bumps it takes when you hop in and out of your vehicle. This is also an area where the battery system being used will be of particular note. A rechargeable CR123A set-up may fit your professional needs, while a pair of AA’s might better address your actual professional situation. It’s an area that thankfully carries a bit of leeway, as these devices generally manage good battery life. Yet it’s absolutely a consideration that should be addressed long before you’re fumbling in the dark for a replacement. One more consideration? Night-vision is no longer relegated to humans. If your primary interest is in observing nature, a decent automatic nature cam might provide all the night-viewing opportunities you could hope for, with none of the “waiting as quietly as possible for as long as possible” required of personal night-vision systems. Again, this is simply a function of how diverse the industry has made this technology since its inception. Be honest with yourself about your needs, because there are a diverse set of solutions available. Common sense rules here, and the industry is thankfully quite clear on what’s actually on offer. Optics can be very tricky, particularly when you don’t have the benefit of magnification to provide some clarity about what’s being gained. However, there’s a simple rule to follow here: cost. Truly, the optics are determined primarily by the tier of devices you’re looking at. Over $400 pretty much guarantees a pristine, specialty-coated set of glass that should serve you well. Yet optics also represent a subjective experience perfectly suited to the power of internet reviews. On any given product page, particularly on Amazon, you’ll find a whole range of anecdotal evidence about lens performance. From those with glasses, those without, those who understand more about optics than you, and those who can barely spell the word. If you’re concerned about the performance of any device in this area, you’ll benefit from finding a few virtual watercoolers to eavesdrop on. It’s hard for any company to accurately express the practical results of their manufacturing process, but the internet lets us get a great sampling of real-world experiences. Use them. The last feature on the list is the most obvious, yet sometimes the most complicated to actually quantify. The “gain,” for night-vision, is the amount of visual data the device is capable of gathering from a particular darkened environment. Yet the manner with which this is achieved, particularly in first-gen systems, provides enough variation to be fairly confusing. For example, a device with a fantastic sensor could have an IR illumination system that subverts the actual quality of the gain. Whereas another, inferior sensor could have a software/hardware combination that results in far *better* gain. And like optics, this is the category that should make you grateful for the Amazon’s and Ebay’s of the digital world. Human eyesight has these variations of day/night vision enough already. If you truly want to understand the capabilities afforded by a particular device, it’s going to be important for you to average out the experiences of your online peers. Now that you’ve considered all the options, have settled on the device you want, and have a fresh piece of hardware dangling from your face and/or neck, you can finally leave behind humanity’s fear of the unknown for good! Though, you may want to consider the stark reality that humans didn’t develop night vision biologically. You are still a normal human, stumbling through the darkness while a bit of technology gives you a good-to-great idea of what’s happening in that darkness. Please, be safe. Your newfound abilities grant no special protection from the normal, boring dangers of roaming the woods and wilderness in the dark. The dangers that drove humanity towards the light don’t disappear just because you have a better chance of seeing them. Of course, having said that, any set of night-vision specs will in-arguably bring you a full step closer to being Batman. If that’s important to you. And hey, at the pace this technology is moving, you don’t have to feel too left out if the best options are out of your price range. The technology of letting humans see things they normally couldn’t is one of the most-reliable growth industries on the planet. Within a few years, your phone will likely carry a few of these features on its own. Still, you’re not going to look like the cyborg cyclops. It’s up to you whether that’s a good or bad thing.